We’re having a great time at Maker Faire! We’ve been pretty darned swamped, but did have a little time to get a few pictures. Some of them are in my flickr set, like the one above from early this morning at our display area. We were lucky to have John Maushammer, the maker of the Pong Watch, hang out with us. One highlight of the day was when the editor of Make: Japan dropped by and brought us a copy with the CandyFab article in it! We also got copies of the brand new Maker’s notebook to play with. 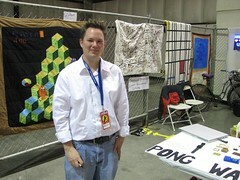 There are lots of Maker Faire pictures up on flickr now– check ’em out!. 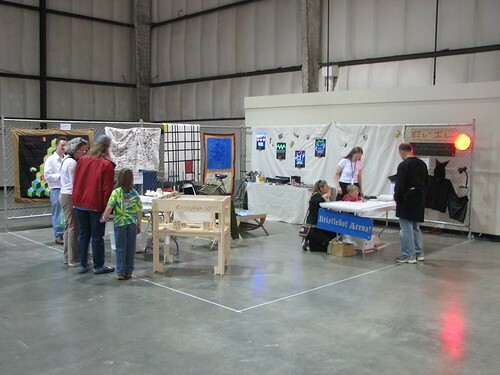 This entry was posted in EMSL Projects, Engineering, Field Trips and tagged makerfaire. Bookmark the Permalink.